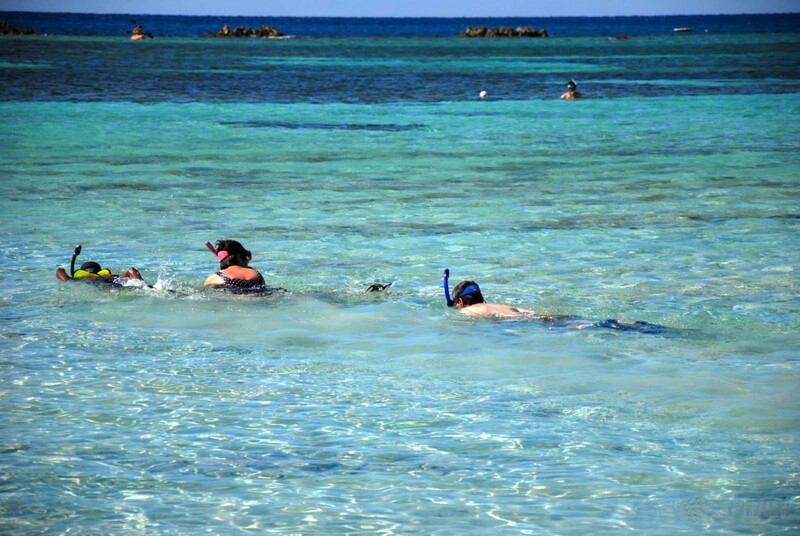 The stay at the beach included a snorkeling trip. 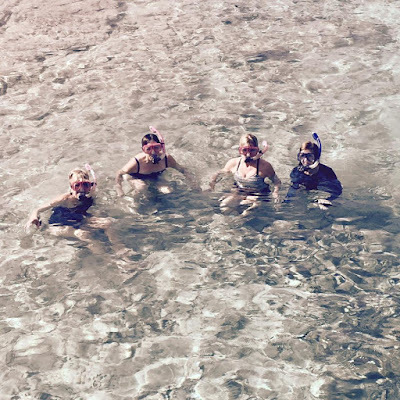 Since a couple of our group are expert swimmers but had not snorkeled, we began by snorkeling in a blue hole. A blue hole is created by the ocean water being allowed into a small cove by a break between the rocks. This provides a shallow pool full of fish, but without the danger of the deeper water. Amazingly the end opposite of the rocks was an entrance into a series of underground caves which run under the island. Some brave divers venture into these dark underground tunnels--but not this claustrophobic girl! 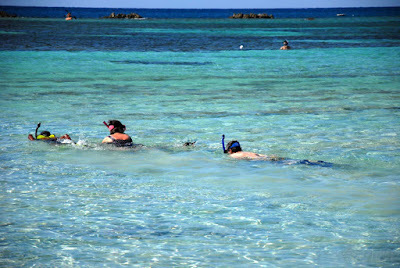 We then went to Paradise Cove and Deadman's Reef for the real adventure. It all began with a short lecture from our guide--stressing the importance of staying together and the plan for the swim out to the reef. Confident of our abilities, none of us wore any type of buoyancy device. 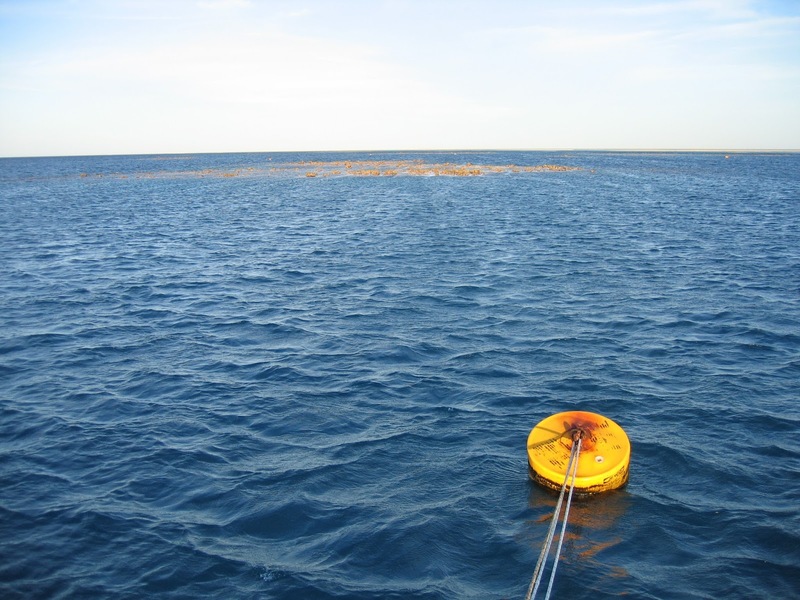 There was a buoy about half way to the reef and then several around the reef. This provided a place to stop--hold on--and get your bearings and rest. The guide made the mistake of saying everyone should take off and we would all meet at the second buoy by the reef. Somehow I managed to get in front of the others. When I stopped at the first buoy, the others were not far behind so I started for the second buoy. The current was very swift and it was impossible to know where you were going without pulling your head up and getting your bearings and with choppy water--that even proved difficult. What I did not realize until I arrived at the second buoy was I had ended up at the wrong buoy. As I held on and waited for the others, I finally noticed over the choppy water the other buoy---what seemed like a long way away. Once it dawned on me what I had done and I started to just swim back to the shore, but then the others would have no idea what happened to me. I had no choice but to swim against the current to the correct buoy. I finally made it to the buoy to the relief of the guide--who had lost sight of me due to the breaking waves. He was greatly relieved, but I only got a quick glimpse of the beautiful-but dangerous deep waters on the other side of the reef. We all headed back to the shore--still fighting the current---and trying to swim a straight line. It took swimming more strokes than normal since we were always having to fight the current which was taking us in the wrong direction. NOW---if I had stayed with the group---followed the instructions---this would have never happened. I became confident I knew where I was going and did not look up to see the goal often enough. I also underestimated the pull of the dangerous current. I ended up working a lot harder than necessary and swimming much more than the others--to reach the same goal. And the sad part---I missed the beauty of some of the sights they saw while struggling to get to the point I should have gone to in the first place. I was thankful for my fins and the buoyancy of the salt water ---without them I might not have made it. Sounds a lot like my path in life---I grow over-confident--forget the instructions--and head into the deep water with dangerous currents. Finding my way back to the intended path can be like swimming against the current--NOT SO EASY! SO---the lesson I learned--do not just listen and know the instructions, but follow them and keep your eye on the goal. And avoid at all costs the swift current pulling you into dangerous waters. The more I read of your exploits the more I think you are very brave. The only water I like is a drop or two in my whisky. Although I prefer American Ginger Ale. There is a fine line between brave and stupid, Victor- occasionally I slip over into stupid! Is Gonger Ale American? Didn't know that! This resonates with me so much! What a great illustration when we do not keep our eyes 'on the prize.' Thankfully God is with us wherever we go too. Yes, Lynn, He is always with us---if we only acknowledge His presence!